In this article, we take a brief look at how cancers that are important in people usually manifest differently in our pets. via A Different Animal: Cancer in Pets and People. In February 2014, FDA’s Center for Veterinary Medicine conditionally approved PACCAL VET-CA1, an antineoplastic drug intended to treat dogs with mammary carcinoma or squamous cell carcinoma. 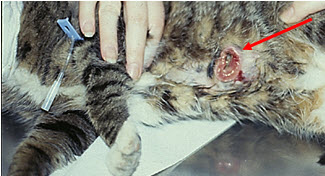 Below is a brief reference guide for veterinarians on PACCAL VET-CA1. via Resources for You > FDA Provides Important Information to Veterinarians about PACCAL VET-CA1 for Treating Cancer in Dogs. To her, “tumor” implied a benign and curable disease, and “cancer” was a diagnosis that indicated something much worse.